"I have been using GIBS products for 8 months on my clients and they keep coming back for more." “Man, y’all have got the best stuff for beards. Love that sh##." "I can't get enough Con Man!! It smells amazing and it works great on ethnic hair! I love how moisturizing it is. Really helps to keep a dude lookin' fresh!" "If my beard had dreams it would be about Gibs. You won't find nothing better." "GIBS is life baby. Sometimes you just can't pick one favorite thing. Sometimes the whole line/company/brotherhood/barberfam are just pure perfection." "Original Outlaw is in my top five favorite styling products for men! Black Kodiak Beard Balm gives amazing tame to beards and adds shine but is also amazing in any thick coarse hair type. I love the whole line!!" "I love the blue.....I keep it at my station ...use it on all the beards and sell it like vodka!!!!" "Colorado Kid: I want to be buried in it. Best scent in the world." "I absolutely love GIBS Grooming! It started with a fantastic beard oil and has evolved and one of the best Men's lines on the market. GIBS has been very supportive of my street cutting for the homeless and cancer benefits." "Two of our favorite new products are Puck it and the Gibs Wipes! The idea behind the wipes and the packaging are just way too cute. Men need maintenance too!" "Original Outlaw is my preference for those that want that styled but natural matte finish. Rico Bandito will leave your hair polished 'n dapper!" 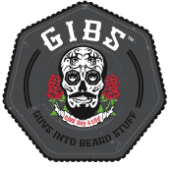 "I use all the Gibs products on all of my clients. I can't keeo it on the shelves! As the wife of a bearded man, I learned quickly the benefits of all of the products."